Our Roman training sessions are held outdoors in fine weather, usually at local parks, and indoors over winter. We aim to make the locations and times as convenient for members as possible. Normal dress is tunic, helmet, sword and balteus, with ordinary sneakers, unless doing a full dress rehearsal. Sometimes the training is for specific events where we are focused on developing, rehearsing, and perfecting particular Roman and Gladiator shows. All soldiers should be familiar with the Latin military commands below. The first command is "ad signa" (fall-in) which means you fall-in as a straight line with the signifer (standard-bearer) at one end. The officer may then tell you to be at ease, attention, eyes-front, or to dress ranks (which means putting your right arm out straight in a fist on the adjacent man's shoulder to keep the spacing regular). He may ask you to raise or lower your shield or pilum, or to draw your sword. He may direct the signifer to march somewhere (say from the camp to the parade ground) and the order "signam sequute" means you just follow the signifer in file. Any mistake in a command and "reverte" means return to your original position (but our Centurion does not make mistakes). Most of the Latin commands end in the imperative plural "-te!" 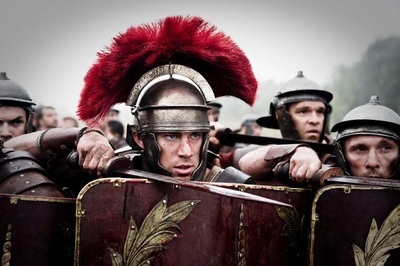 so that when an order is given, the officer will announce (for example) "scuta porta..." (so that you know to get ready to raise your shield) and on "TE!" we all jointly execute the command. It pays to be well-versed, because the soldier that forgets may be reminded by the centurion's stick on his helmet (all in good fun of course). It may be that with a command like "gladios recondi..." there is a longer pause, because the centurion is watching to make sure everyone has the tip of their sword in the scabbard, before issuing "TE!" so we all resheath our swords in unison. All commands should be executed in unison. The finer points you will learn in training. Although it may appear that there are a lot of commands, they are relatively straightforward, and after a couple of training sessions you will be executing commands like the best of Caesar's veterans. Sacrate - "Fido Roma imperator sodales!" When marching, you will always be in either a rank or file. Simple commands are "procedite" (proceed), "accelerate" (faster), "tardate" (slower) and "consiste" (stop). Remember to execute on the "TE!" (the suffix for a plural imperative). Marching in file is easy, just follow the man in front. But marching in rank you must keep at a uniform pace to advance together in a straight line. Your right is "ad gladios" (to the sword) and your left is "ad scuta" (to the shield). The turn command is "clinate" (incline) so "ad gladios clinate!" turn right and "ad scuta clinate!" turn left. The about-face is "transformate", so "ad scuta transformate" all rotate left about the shield, or "ad gladios transformate" all rotate right about the sword. 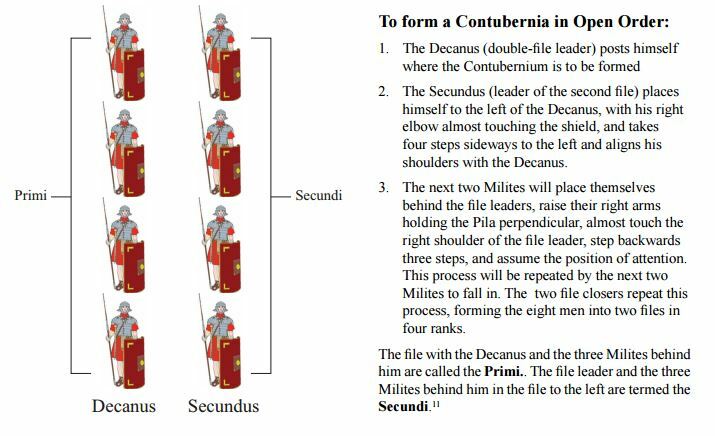 When marching in file the command "convertite" is for the leading man to make an L-shaped turn, and as each soldier behind approaches the same spot he turns neatly to follow, so "ad scuta convertite!" L-shaped left turn, and "ad gladios convertite!" L-shaped right turn. Easy! When marching in rank the command "rotate" is to make a wheel where the whole rank turns 90 degrees, so the man acting as pivot marches on the spot, while the other soldiers march at the various speeds necessary to keep a nice neat line for the circular turn, with the last outside soldier moving fastest. All eyes look toward the stationary pivot as the reference point for keeping the line dressed straight. Once the 90 degree turn is complete and the rank advancing straight forward again, the pivot yells "Move!" (pronounced mu-way) to indicate the wheel is complete. For "ad gladios rotate" the rank wheels right with the last man on the right acting as the pivot. For "ad scuta rotate" the rank wheels left with the last man on the left acting as the pivot. Note that if you do a right wheel, and then "transformate" (about-turn) and do another right wheel, the pivot-man changes ends. The "rotate" requires the most practice so that the rank makes nice neat uniform wheels. A lot depends on your fellow soldiers, and our unit is very good at doing wheels, so it won't take long for you to fit right in. The next group maneuvers require the shields. The simplest is "ad castorum" (shield-wall), which means the rank holding their shields together in a straight line. You may be ordered "lungete" (close-up) or "largite" (open-up) depending how tightly your officer wants the ranks together. You may be ordered to advance in shield-wall, at a steady pace, and chant in a threatening manner, perhaps "sin-dex" (left-right) or "move" (pronounced mu-way). If ordered to draw your sword it is held point-forward against the side of the shield. Swords can also be presented along the top of the shield "gladios scuta". The order to charge the crowd will probably come as "accelerate" (faster) or maybe just "percutite!" (charge!). If not given separately, it includes the orders "clamate!" (make the battle-cry, which is generally just "arrghh!") and "gladios tollete" (holding your sword above your head in a threatening manner, point BACKWARDS). It is important when charging to hold the sword point backwards, so in case you trip, or some kid from the audience runs in the way, the danger of injuring the public is reduced. Use your own judgment to halt before hitting the crowd, because often you won't hear the centurion's command. You really do not need to get too close, because they are going to be scared enough already at seeing a line of screaming Romans with raised swords charging at them. The point is to have fun! Next simplest with shields is the "orbis" (form a circle), often around the signifer or centurion. This has no real set procedure, but in practice we just run together and somehow naturally form a circle of shields quite easily. The centurion may walk around the perimeter probing for gaps with his stick, or else a barbarian with a spear if we are putting on a show. ​The vallum formation comprises the front row of shields resting on the ground with the soldiers crouched behind, and the second row of shields resting on top and angled backward to give protection from arrows. It is easier to put shorter men in front, and taller men behind. 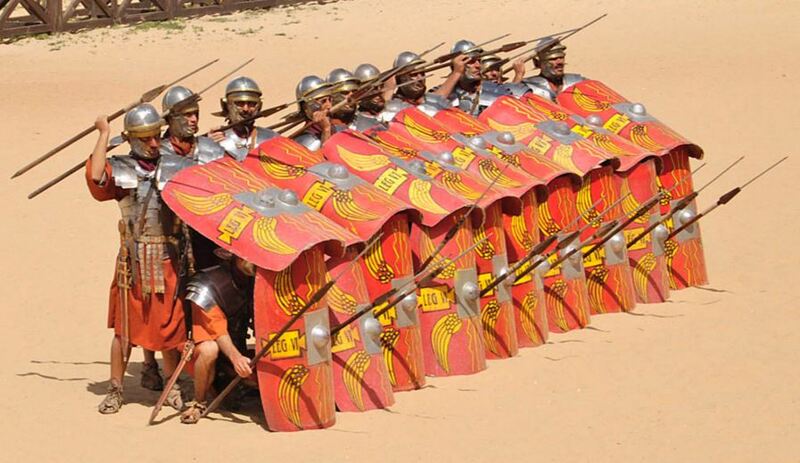 During a display, the centurion will yell "ad vallum" and we assume the vallum formation. The archers will fire dummy-arrows into the shields, usually two waves, and you will hear them call "nock, draw, fire" and when they are finished "clear!" The centurion will yell "procedite" and we rush forward (usually only 4 metres or so) before he yells "vallum" again. The archers will shoot, and we keep advancing in this fashion until they run out of arrows, or we are close enough to attack them, at which the command "percutite!" (charge!) and we mock-kill them, the archers often hamming up their deaths. 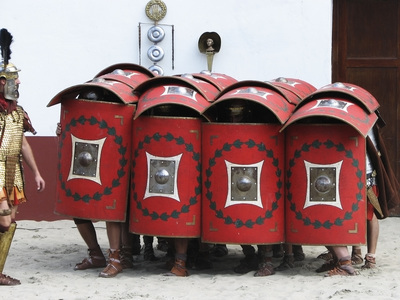 The testudo formation is made with the front row of standing men in shield-wall, while the rear lines hold their shields above their heads to form a roof, resting on the rim of the shield-wall. Again, it works best with shorter men in front, taller men behind. The whole formation then advances together at a steady pace, chanting "sin-dex" (left-right) a step at a time (or "move") keeping the shields tight together. This takes some practice, but our soldiers are very experienced at it, so it is easy for new recruits to slot straight in. The archers will be firing at will in this case, as we steadily advance. The front man may need to peep through the shield gap to check we are going straight, although an experienced unit usually does go straight, or the centurion might give commands to move more left or right as required. Again, once we are close enough to the archers we can kill them. The other maneuvers we can work on are "ad cuneum" (form wedge) a shield-wall formation used to force our way into barbarian lines. Also the "ad unum" "duo" "tres" (form one, two, three lines) that needs practice to execute quickly and smoothly. 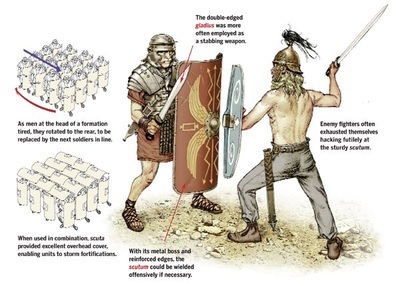 The "pugnate" (fight) command means the front line engage the enemy with their swords (the enemy can be other Romans, auxiliaries or barbarians). The command "mutate" (change) the front row rotates back right, and the row behind step in from the left side to take their place engaging the enemy. The command "sin mutate" the left side change while the right remains engaged. The command "dex mutate" the right side change while the left remains engaged. 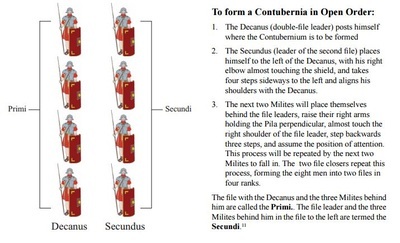 The command "ad contra" double files turn in opposing ranks facing outwards. 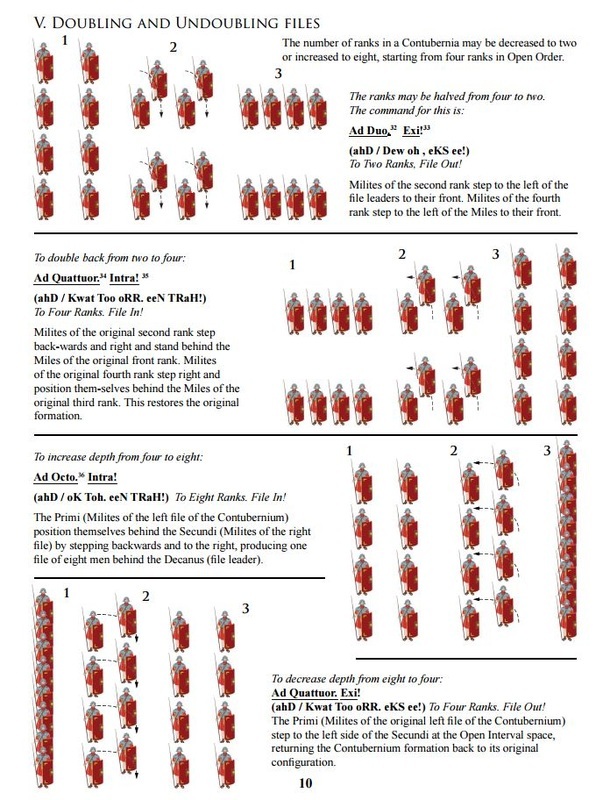 We begin every training with a warm-up using our standard marching pattern (below) which covers all of the wheels executed from all four sides of a square. Your trainer will do a dry-run first, and then each man in order will take turns issuing the commands to the group, so pay attention for when it is your turn. Once this is completed satisfactorily, we can move to free-style commands where the cohort can move to randomly given orders. It is possible to train at home alone by just following the standard marching pattern, or groups to train independently, but know when we come together we are all familiar with the same exercise. We are a display club, so all our fighting is choreographed for display purposes only. However, we use real weapons so every precaution is taken. We go into every live show with a script that has been agreed and rehearsed by all members, with opportunity to amend, so that every member knows exactly what is required. Any member is free at any time to raise immediately any concerns regarding safety. We do not do impromptu with weapons because of the potential for accidents. Training with the gladius begins with the Fives, a series of five sword blows to the right side of the body ( head, shoulder, waist, hip, gut-thrust) as your opponent blocks with their sword, and then repeat on left side. The Fives was devised so that opponents that have never fought before can confidently engage without any cross-body blows. It can be practiced alone, first the strikes, and then the blocks. 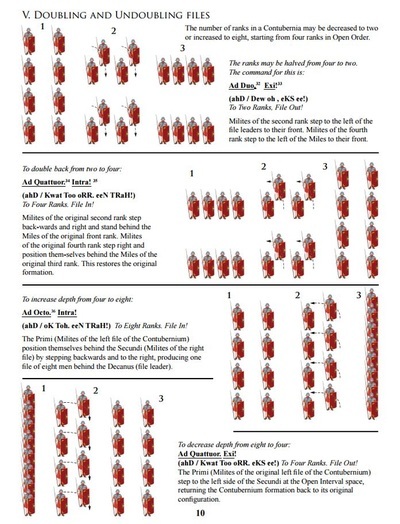 Once the Fives are mastered, the next pattern is the Box, which also comprises five blows (head, right-shoulder, left-shoulder, right-hip, left-hip) but now including cross-body blows, and the corresponding blocks. The purpose of Fives and the Box is both for sword practice, but also to give some some simple moves that can be included in a choreographed fight, sometimes if you just want some filler-moves before doing some set-piece. The ancient Roman sword practice included striking a pell wooden-post, which our centurion Pete Rogers often erects at Roman display events so we can demonstrate to the audience. We also demonstrate the advantages of using the scutum in conjunction with the gladius as a stabbing weapon against the barbarian long-sword's slashing action; due to speed, exposure of vulnerable kill-spots, and efficiency by saving energy. The Romans fought as a team, so one Roman may simply aim to block and hold his enemy's sword, leaving him exposed for the adjacent Roman to make the kill, or even with a third Roman forcing open the enemy's shield; meaning that each enemy is always fighting at least two Romans at once. Even better is the "saw-tooth" formation, where the job of the front row is simply to stay alive by blocking the enemy swords, then the second line steps forward between the gaps to stab the exposed enemy before retreating to safety again, so that the two lines working in combination literally "saw" through the bunched enemy. In this way 10,000 well-trained Romans were able to mow down some 80,000 barbarians advancing across the battlefield in an afternoon. We also have a professional stunt-coordinator, Alex Holloway, who is a genius at arranging exciting and safe choreographed fights if you are keen. We also find it is good to train in regular pairs, as our gladiators do, so that you get used to your opponent and are entirely comfortable fighting them. For missile weapons, we have pilum practice throwing at targets. In an actual Roman show we used dummy-pilums thrown at the opposing vallum or shield-wall so that it is entirely safe. We also have the opportunity to practice archery shooting at a stationery target, a moving target (Roman advancing in zigzag behind shield), and the vallum or testudo formations. When using archery in live shows we need to be able to fire away from the audience to prevent accidents from any ricochet. Our Roman ballista can be used to fire blunt darts on low power at advancing enemy behind shields, or on high power just as a demonstration to show the audience how incredibly far the darts can go. There is a safety protocol associated with the ballista operation.